Hold Your Breath, It's MODERN ART! ART. What does these three letters mean for you? More than letters? If you are also into the ART, then... here we go! Who am I? Well, my name is Kiun and I am expat in Beijing. I grew up in the coldest place on the world (-50 C, I am not joking), which is called Yakutia. The eight largest territory in the world, larger than Argentina and just smaller than India. For some time I had been living in Moscow and for sure, it was amazing time of my life... however, after 5 years, I have decided to move on! And, as you can guess, I went for Beijing. Why BJ? To be honest, It was a random choice. Maybe it is not what you expected to hear: “I have always dreamed about China...” Nope. But now, I understand that it was just like a destiny. Sometimes, in your life happens absolutely unexpected things that completely change your life, even in midnight, siii! By now, I have already been living here for almost 2 years and totally fallen in love with this city! I met a lot of interesting, highly motivated, ambitious people with lots of energy to create something new. Thanks to them - now I have a similar feelings and it’s one of the reason, why I chose the Wellcee team. What do you appreciate on such a big cities? People, hiking, sport, bars, good spots or museums? Maybe you have noticed and maybe not.. but in Beijing you can easily find lots of exhibitions and events related to modern art. It probably has to do with fast-growing city with an interesting and creative population. Don’t you agree? Modern art is renowned for its avant-garde aesthetic and celebrated for its forward-thinking artists. Developing for more than 100 years, it incorporates many major art movements and has inevitably seen an eclectic range of styles. Not to be confused with contemporary art, the “modern art” label refers to late 19th and early-to-mid 20th century. Works produced during this time showcase artists' interest in re-imagining, reinterpreting, and even rejecting traditional aesthetic values of preceding styles. One of the famous original place for living in BJ is of course – Wangjing. Wangjing is famous for the 798 artists area. Our Wellcee team working exactly in this district, which is inspiring us to do more creative stuff and sharing with you more and more interesting places. After some time it would start to be boring if you are observing just only one place, like 798... So, I prepared for you, my lovely Beijingers, something new! Hold on and write down in your notes! As you noticed, this place has his very own style and completely exceptional design. There are 9 exhibitions halls, employing red bricks as the basic architectural element. 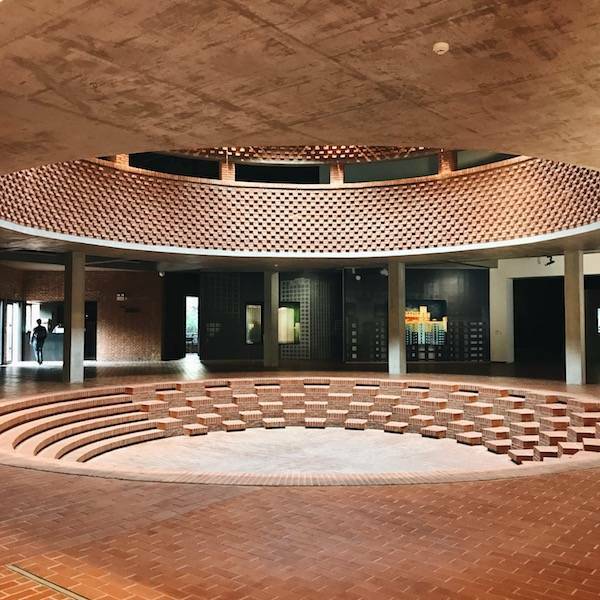 Moreover, you can also explore landscape courtyard which was designed and built in a way deriving from the Chinese Garden scenic conception is also a highlight feature of Red Brick. Tickets:Bring your student ID for getting a big discount! The price usually depends from the exhibitions. Location: Hegezhuang Village, Shunbai Lu Cuigezhuang Township, Chaoyang district. Maquanying subway station exit B or Hegezhuang stop by bus 944 / Xiang jiang bei lu xi kou Stop by bus 988. Mostly, they are focus on the trendy Chinese contemporary art. At the same time, TAM strive to discover and support young artists in the community. And one important thing, Today Art Museum is located in Chaoyang District in the heart of CBD area and its avant-garde exterior stands out amongst other places, fusing industrial relics with the cotemporary for a look that is as unique as the art it holds. Architector of TAM has made sure contemporary art has a place to be noticed. Tickets: Student ID for a big discount! The price usually depends on certain type of exhibition. Location: No.32 Baiziwan Road, Chaoyang District, Beijing. I can describe this place by the three words: SPACE, BRIGHT and MINIMALISM. What else you would need for contemporary art museum? Of course, except exhibitions. This place perfectly fit for spending time with yourself, enjoying the decoration of this modern place, catching the rays of the sun and drinking aromatic coffee... "bringing art to the public, bringing people into the real world of art" this is about Minsheng Art Museum. Tickets: It’s free. BUT! please check it online in advance. Location: 9 Jiuxianqiao, Chaoyang District.